During this third week of Advent, I celebrate all those people who risk their life to share the hope, peace, and life that we gain as we place our trust in Jesus. 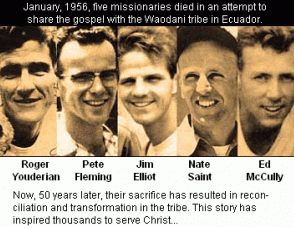 Philip James Elliot (Oct 8, 1927 – Jan 8, 1956) was an evangelical Christian who, along with four other missionaries, was killed while sharing the Gospel message with the Waodani people of Ecuador. His words remind us that we can live for today, which is finite, or we can choose to live for eternity, impacting lives in ways that add value and endure. the intelligence of the intelligent I will frustrate.'" The story of the Elliots is so moving. Thank you for sharing this, Dr. Mari, and for keeping our eyes on the eternal!